Please note: CDIAC will regrettably no longer be performing annual data updates to our interface for NOAA's USHCN database, with the final year of data being 2014. Users can obtain both monthly and daily USHCN data, in much more real time, directly from the compilers of this valuable database via NOAA's National Centers for Environmental Information. 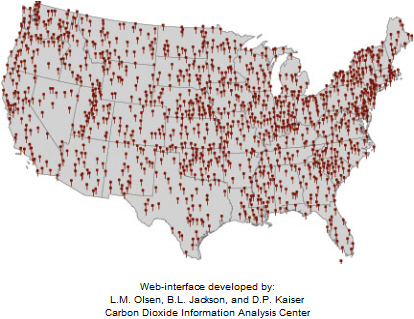 Several entry points to these data are available from NCEI's Climate Data Online page. We are sorry for any inconvenience. The United States Historical Climatology Network (USHCN) is a high quality data set of daily and monthly records of basic meteorological variables from 1218 observing stations across the 48 contiguous United States. Privacy & Security Notice · Berkeley Lab · ESS-DIVE · Contact Us · This page was last modified: 07/08/16.